A Baía de Kotor - também chamada Boka - oferece ilhotas, cavernas e muito mais. Este passeio de barco permite que você experimente seus destaques de maneira mais fácil e cênica do que viajar de carro alugado ou de transporte público. Pre-book para garantir seu lugar, e visitar a igreja da ilha de Nossa Senhora das Rochas, uma base submarina da era soviética, e a Gruta Azul, para nadar em suas águas azul-néon. Uma escolha de partidas fornece flexibilidade importante. This was the best tour ever ! We arrived in Kotor but due to slow tendering it took us over 2.5 hrs to get off the ship. We called them from the ship and they said no problem we will wait for you. They gave us the directions and were meeting us just like they said. Nano the boat driver was awesome, went to the amazing blue caves and the Lady of the Rock, submarine area. We saw everything and was amazing. Best way to see Kotor in a short period of time. 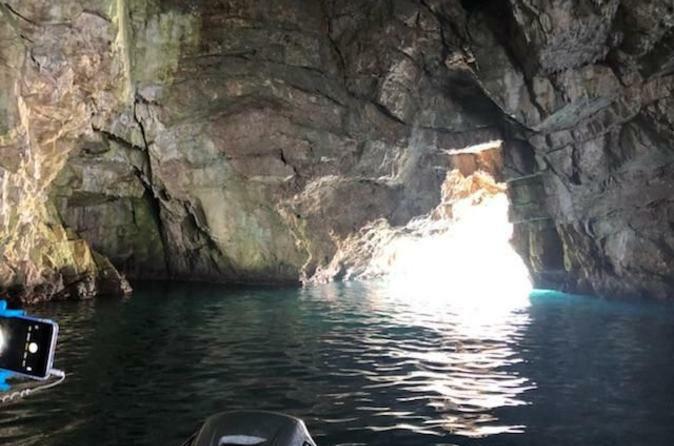 The Blue Water Caves are amazing and can only be reached by boat. Our group of 12 were the only ones on the boat which made it amazing. We had a great afternoon. Alex was a very good informative guide. Just wished we had brought our swim things. Getting to the tour from our ship couldn't have been any easier. The tour departs from a small park that literally touches the side of the cruise terminal. We started with a nice tour to through the fjord on our way to the Lady of the Rocks. Our tour guide (Alex) was very knowledgeable and pointed out several sights along the way along with plenty of history of the area. We stopped at the Lady of the Rock and for some time to explore the church and museum before being whisked away. We then got to see a WWII submarine base built into the side of the fjord, which was VERY cool! Our tour guide then brought us out to the Blue Cave. He recommended not swimming in the main cave as several boats come through there and it could be a bit chaotic. He dropped us at 2 smaller caves right next to the main cave. The water was beautiful and the caves were very cool. The water was certainly a shade of blue that I have never seen before. The trip was fantastic and we would certainly recommend it to any family or friends going to that area! We were on a Holland America cruise and thought we would try to venture away from the cruise company tours and this worked out really well. The waterfront park is immediately to your left as you exit the cruise ship port. The tour operator was organized and had out names on their list and was operating 2 boats. Ours was brand new and Neno, our guide was great. The water was clean and calm. The church and the island are unique and he knew the history. Next we explored a Russian submarine cave, that was very cool and surprising since we didn't know it was part of the tour. 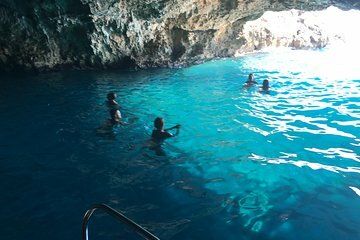 The blue cave was pretty big and after we went in with the boat we all enjoyed a swim just outside the cave as it's not best to swim inside because of the exhaust fumes from tour boats build up in there. If you're not a comfortable swimmer, bring or ask for some sort of flotation. If you like to snorkel, bring your mask. All in all we think it was a great value. There was plenty of time after to visit the old city which is just across the street from the terminal. Expected bigger boat - driver was nice but just dropped at church - no commentary. Blue Cave wasn’t blue since sky overcast. Mom and daughter got soaked on boat ride.